These windows are about leaving our human desire for autonomy and moving back to the Father, as in the parable of the Prodigal Son. This difficult process of change has been rendered here with simple forms and by means of a horizontal progression. At the left is the side of life, at the right the side of death – this is the way in which we customarily portray the course of life in our culture. However, the process is reversed here. We move from death at the right to life at the left. In the window to the far right a dark U-form can be seen, facing towards death. A small glowing red spot – perhaps the conscience – depicts the need for change. Transformation starts with a U-sign full of injuries reaching towards the side of birth. Vehement lines (temptations) are in its way. In the second window from the right the speedily progressing U-sign is already much lighter, even though there are still vertical transverse lines attacking the process of change. A narrow white-golden ‘impulse’ from above gives the strength to go on. In the third window from the right we see the finally reached pre-taste of the full divine light. A golden-yellow ray breaks free from the beam of light at the top and reaches the figure that is hurrying along to the left. Only in the most left window a further change of direction takes place. Upon arriving at the side of birth and especially rebirth the U-form stretches up in white, cleansed from all signs of decay. Communication with God is restored. This vertical sign points moreover to the resurrection from the dead as well as to the deathless future of the Christian. I find this sign so important, because it is this foretold last supernatural act of God that prevents many from believing the Bible. As long as the dead remain dead, this very powerful experience-atheism unfortunately cannot be contained. Four small messages – only aesthetic messages? 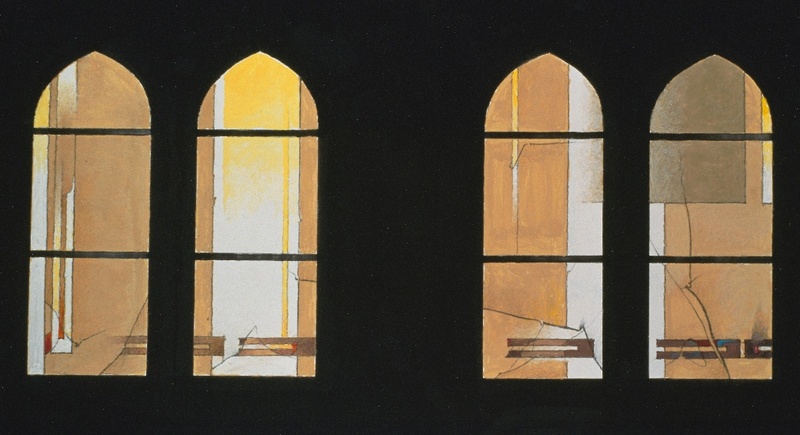 Johannes Schreiter: Windows in the baptismal chapel of the St. Nikolai Church in Kiel, height 1,10 m., 2002. Johannes Schreiter was born in Buchholz, Germany, in 1930. From 1949 - 1957 he studied in Münster, Mainz and Berlin. From 1960 - 1963 he worked at the Staatliche Kunsthochschule Bremen. From 1963 - 1987 he was professor at the Staatlichen Hochschule für bildende Künste in Frankfurt am Main, from 1971 - 1974 as its director. Since then glass painting has been the centre of his art. The architecture, the concrete space and its function, always form the point of departure for his work. He made windows (among others) for St. Marien/Lübeck, the Heiliggeistkirche Heidelberg, the Melanchthonkirche Mannheim, St. Nikolai/Lüneburg, the Marktkirche Goslar, the Dom of Frankfurt/Main and for churches in other countries in Europe, the US, Japan, Australia and New-Zealand. Also his expositions, publications and positions as guest lecturer in Germany and elsewhere deserve mentioning. A grave illness forced him to give up his chair in 1987. At the moment he lives in Langen (Hessen). * Johannes Schreiter: Glasbilder. Verlag Das Beispiel, Darmstadt 1988. * Birgit Schwarz: Johannes Schreiter. Das glasbildnerische Werk von 1959 bis 1980. Hessisches Landesmuseum, Darmstadt, 1987 (ook: Heidelberg, Univ., Diss.). * Holger Brülls en Gunther Sehring: Johannes Schreiter. Glasbilder, Zeichnungen, Collagen 1995-2011, Kunstverlag Josef Fink – Lindenberg, 2011.